Well, here you are going to help the protagonist save his girlfriend and do everything to take all things that you can use then. Be really attentive and pay attention to every detail. Everything depends on you, so enjoy the game right now. Are you brave enough? Then this game is for you! The main point is to explore this territory and collect all the useful things here. 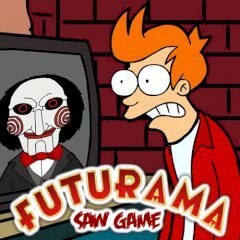 So, there is the only one way to the win, and you should help Futurama to save his beloved. Well, it is not so easy, that is why you must be really attentive and just escape from this strange place. So, if you are ready for such a cool challenging game, then do not waste your time and you will cope with it right now. It is not so easy, so have faith in yourself and enjoy the game.